Each networked MFD can be configured independently, and the connections are completely waterproof for operation in corrosive marine environments. The switch has LED indicators for individual line status. Plug-and-play design means that all peripherals are automatically detected and readily accessible once theyÆre connected to the network. 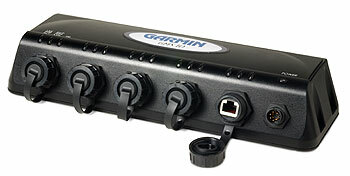 Likewise, owners can easily expand their systems by using the same standard data cable to plug additional units and displays into the GMS 10 network ports.